I must admit I was quite a trading card game geek back in the day. I used to carry my decks (MTG, Pokémon, Yugi-Oh!, Mitos y Leyendas, a latin american trading card game) to wherever I went. I bought booster packs often and was a frequent visitor of the Wizards of The Coast website. TCGs weren't as popular here in my country as they are in the US. Most tournaments have very low impact in the world wide community and most of them are isolated from each other. Meeting people was also hard. Most of them were younger than I was or just collected the cards for fun. Usually, it was all about the people I already knew and very few of them played on a regular basis. I still keep loads of cards at home (in binders and shoe boxes). Many of them aren't deck material anymore so I keep them for sentimental value. I received my beta key for Hearthstone a few weeks ago. I'm a huge Blizzard fan so I was really looking forward to trying it. It's a bit slow in the beginning as any other card game is. But the game mechanics makes it easy to quicken the learning process as opposed to the hours reading all your cards would take. This accelerates the pace of the game overtime allowing players to concentrate on responding to their opponents' strategies swiftly while the interface helps them handle the technicalities. 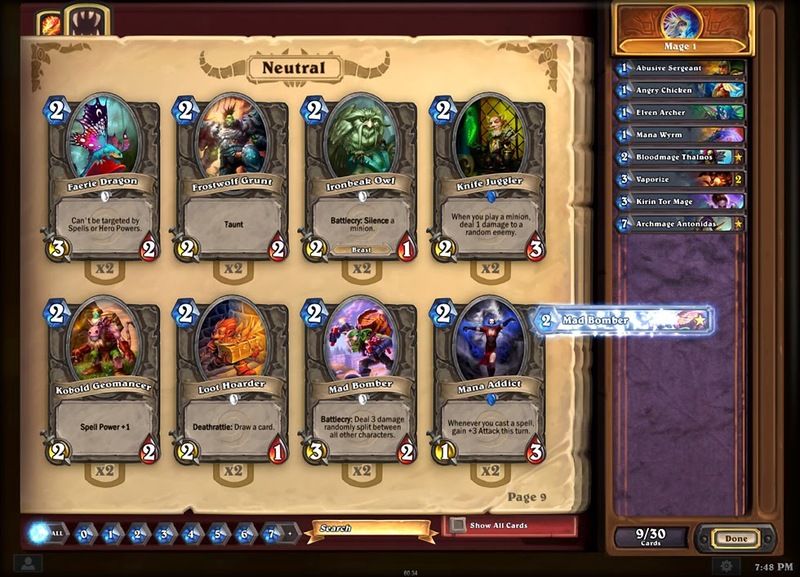 The other amazing feature that Hearthstone offers is the ability to maintain a neatly arranged collection. I'm particularly obsessed with keeping my collections organized and I used to spend plenty of time organizaing my cards and it was hard task to accomplish. Booster packs are relatively cheap and fairly easy to win. So you can expand your collection by playing a lot or by putting some cash into it. The Arena, also provides an amazing platform to discover new cards and earn better prizes as you move forward. There are different play modes you can choose, whether if you're looking for a warm up session before exposing your deck to the world or you're ready to fight your way to the top in the ranked matches. Game play is simply fantastic. It's so easy to learn which takes away the overwhelming sense some people get when they jump into a trading card game for the first time. Ranking anxiety levels are way lower than you would expect. The game doesn't come forward as hard to master but rather as a challenging, unexpected and above all, fun experience. This brings us to the interface. The characters and dialogues are charming and witty. Along with the music, it gives the player the feeling of dueling in an old tavern filled with mighty warriors and sly assassins (who just happen to know how to play a card game). But Blizzard's creative genius shines in the battle arena. Functional catapults, castle gates, beasts lurking in the shadows, waterfalls, campfires. These small interactive elements within the arena are a fun way to kill time while waiting for your opponent to finish their turn. 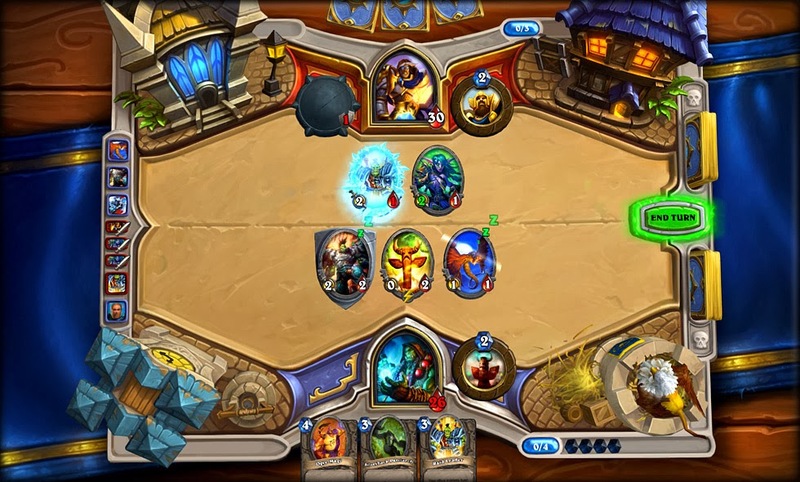 Hearthstone is a game that expands Blizzard's competitive gaming realm. A smart move considering the success of StarCraft and the thousands of trading card game fans already captive in the scene. The game also takes advantage of the already rich and vast world of Warcraft (see what I did there? ;D). With characters that already occupy a space in the hearts of every Blizzard fan and a spoonfull of lore thousands are already familiar with. This is a game that's definitely worth playing and mastering if you are seriously into it. There's lots to learn from it from a development point of view. If you don't have your beta key yet, go and update your beta profile at battle.net. Maybe you could be in the next lucky batch! Also, as you already know, it solves my time old quarrel with trading card games which is, the characters wouldn't pop out of the cards and fight each other as they did in the Yu Gi Oh cartoon. Yes, I am a nerd. But if you're reading this...so are you. Me gustó el juego, pero siento que es demasiado tranquilo para lo que usualmente juego :P ! Pero eso si, es muy sencillo de entender, pero necesita algo de tiempo para dominarse.